What led me to see this movie was the catchy title – Superman comics were highly popular in India when I was growing up and my brothers and I used to have endless debates as to who was stronger, Superman, the Phantom or Tarzan and which one we needed on our side to win any battle! So I could definitely relate to an African-American school administrator who grew up in the projects talking about, as a child, “Waiting for Superman” to come and save the broken school system in his neighborhood and then being heart broken when he was told by his mother that Superman was not real! 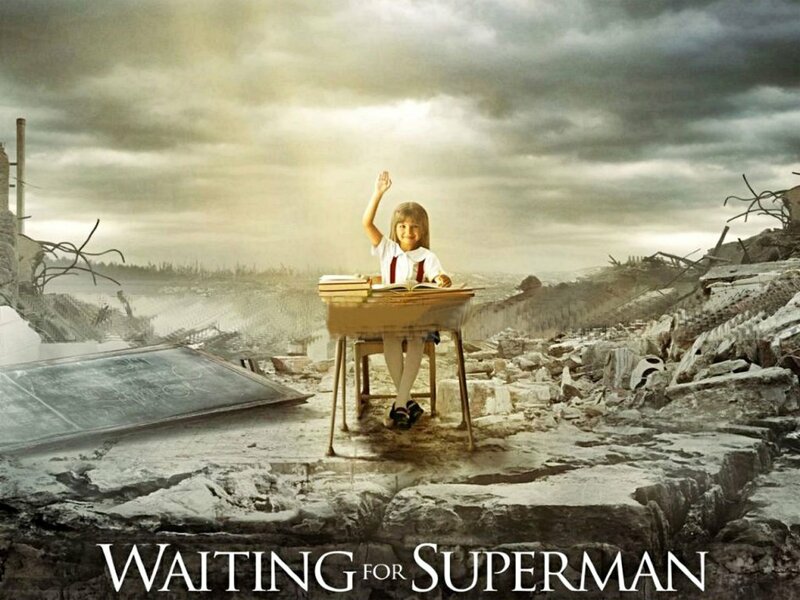 The gist of the movie is that it is you and I who need to do our bit to fix the US school system – Superman is not going to show up to do this job!! The sentence that resonates for me is a statement made in the movie that “till the 70s, the USA had the best public school system in the world” and on the screen flashed pictures of all the luminaries in all walks of life that had graduated from the public school system and all the great strides made in the US in the fields of science, math and engineering during that period. The next thing that struck me, which is something that I mentioned in my review of “2 million minutes” (scenes from which were used in this movie), is the fact that in those days, only around the top 20% of the students graduating from High School went on to college (to become CEOs, doctors, engineers, etc), the next 40% went on to vocational schools (to get jobs as computer operators, etc) and the bottom 40% just went to good jobs in manufacturing, services, etc. (This is exactly what we in India thought was a great thing – that kids who had no interest in higher learning were not being forced to go to college just to collect a piece of paper to improve their job prospects). The problem is that the US economy (which is now tied way more tightly into the global economy) is no longer the same. High unemployment on the one hand exists side by side with lack of qualified employees to fill hundreds of thousands of jobs available in areas like high tech (a point made in this movie). The film also makes the point that when Nixon opened the door to China in the 70s, American businesses were salivating over the prospect of being able to sell every Chinese a toothbrush (for example), which meant American businesses could sell a billion additional toothbrushes, not realizing that, in due course, it would be the Chinese who would be selling toothbrushes to the US putting US manufacturers out of business! The film focuses on the worst performing public schools in the US and the (lack of) prospects for children graduating (or dropping) out of such schools. Also, the whole idea of the lottery system to assign children to better schools (with the children, sitting at the lottery drawing, watching with devastated faces as if their world had come to an end at such an early age, when they did not get picked) seemed like a travesty to me. Why not just have some kind of entrance test where the children at least get a sense (which might influence their entire outlook on life) that they can get somewhere due to their own efforts and abilities rather than pure luck? Looking at this topic from the perspective of someone who grew up in India, when I look at these (so-called) worst schools, almost every one of them looks better than some of the (what we considered) “better” schools in India. For example, the school I went to from KG to 6th grade was located on top of a busy railway station with heavy and noisy traffic just outside of the school gates. And yet, this was a “better” school for which my father stood in line overnight to get me admission there because it was run by Christian missionaries who had a reputation for imparting a solid education (meaning it had great teachers) and strict discipline (including corporal punishment, administered even by the Principal or the Head Master, in special circumstances!). And there were schools on top of movie theaters, schools with broken windows and hardly any facilities for learning, etc and yet students from these schools have made it big both in India and, in fact, many have come to the US and done well here as well. So how come US students (with access to comparably much better facilities even in their “worst” schools compared to their Indian counterparts) not fare better than Indian students coming from schools with practically no facilities? In my opinion, the answer is just two factors – “Great Teachers” and “Strong Families”. Motivated students (with parents) who believed that only education could pull them out from their poor and lower middle class life style (example: I grew up in an apartment with just one single room and a kitchen with parents and 4 siblings sharing this space resulting in all the kids having a burning desire to learn, succeed and reach a better standard of living, which we all accomplished). So when I see the so-called “poor” people in the US (depicted in this movie), probably living on Government dole, having relatively nice apartments, driving decent cars and with no shortage of basics like food, it makes me wonder what would motivate kids from such families to stay in school and get a decent education, especially if the family is broken, with no tradition of higher learning. When it comes to the topic of having great teachers, what strikes me in this movie is the implication (which could be an overgeneralization) that in the US, Teacher’s Unions have such a stranglehold over the system that even an innovative administrator like Michelle Rhee (trying to reform the DC school system) is not able to push through a reasonable scheme that will reward better performing teachers (while not even threatening the jobs of poor performing teachers). In India, teachers (whatever they are teaching) are supposed to be treated with utmost reverence (because of the Indian tradition which teaches, in the order of respect, it is “Mata, Pita, Guru, Daivam” – meaning “Mother, Father, Teacher, God”), that is, teachers are supposed to be respected more than even God! And correspondingly, it is expected that for teachers (for whom earning money should be their lowest priority), nothing should be more important than sending out learned kids into the world. From what I saw in this movie, the implication that many (but this again could be an overgeneralization) teachers in the US are just like any other vested interest protecting their rights and jobs with scant regard for the quality of education they are providing to their students and having least interest in the future prospects of their students. Themovie’s main thrust appears to be that till the matter of eliminating poor teachers and rewarding the good ones is addressed, however much money is poured into school education by the US Government (where a lot more money is available to expend compared to relatively impoverished places like India), nothing substantial is going to change. However, to conclude on an optimistic note, the movie depicts several people who are cognizant of the problems facing the school system in the US and who are coming up with innovative solutions (like the Kipp schools) and, in my opinion, in due course, sufficient course corrections will take place making most US schools once more the citadels of learning (accessible to children, from all strata of society, who are motivated to learn) that would again become be the envy of the world. You are currently browsing the archives for the Superman category.